This blog is one of a six-part series celebrating World Food Day and highlighting the particular food and nutrition security challenges faced by African nations through six case studies in the Brookings Global Ending Rural Hunger project. The findings summarized below can be found in more depth in the Ending Rural Hunger Nigeria case study. The other case study countries include Uganda, Ghana, Tanzania, Senegal, and Ethiopia. International efforts are intensifying to end hunger and address the emerging challenge of feeding rapidly increasing populations, especially in the developing world. Globally one out of every three persons is undernourished, overweight, or obese. One in five children under five (or approximately 161 million) is stunted. Many countries lose some of their gross domestic product (GDP) due to undernutrition—up to 11 percent in the hardest-hit African and Asian countries. In response to global food and nutrition security (FNS) challenges, a number of governments and international organizations have adopted plans and developed policies to improve diets and lifestyles of people around the world. One major effort is the Sustainable Development Goals (SDGs), within which SDG2 explicitly calls to end hunger, achieve food security and improved nutrition, and promote sustainable agriculture. In Nigeria, malnutrition, slow progress in reducing hunger, and new socioeconomic challenges highlight the urgent need for more concerted efforts by key stakeholders to address FNS in the country. Nigeria accounts for 14 percent of all annual maternal deaths worldwide and 13 percent of all global deaths of children under age five. The alarming levels of these two indicators, which reflect level of food and nutrition insecurity in a country, are surpassed only by those for India. Moreover, latest reports rank Nigeria first in Africa and third globally on the incidence of malnutrition. Indeed, nearly 13 million Nigerians still suffer from hunger, with wide disparities across geopolitical zones and between urban and rural areas. 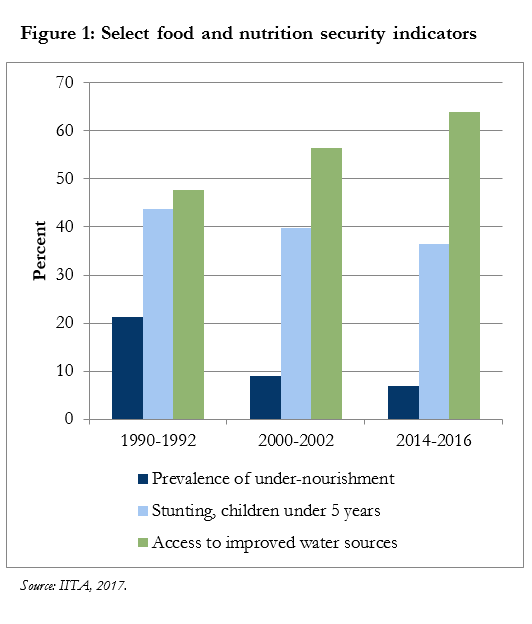 Between 1990 and 2016, Nigeria made modest achievements in FNS, especially with regard to undernourishment, stunting, and access to potable water (Figure 1). The escalation of insurgency and the displacement of 2.6 million people since 2014 have compounded the country’s challenges. According to the ERH database, Nigeria’s overall FNS needs are less severe than the average African country, although it is still ranked 81 out of 116 developing countries in terms of severity. In addition to its exceptional burden of malnutrition, Nigeria particularly struggles with a low agricultural productivity gap, inadequate access to food, and vulnerability to shocks. The persistence of food and nutrition insecurity in Nigeria is due to several factors, including rapid urbanization, high population growth, low agricultural productivity, restricted access to education and health services, inadequate supply of basic amenities, poor hygiene and sanitation, limited access to potable water, and poor infant and young child feeding practices. The social intervention policies of the current administration are wide-ranging and aim to create job opportunities, promote school feeding programs for 5.5 million children, and provide financial support for up to 1 million vulnerable beneficiaries through a conditional cash transfer scheme. All of these interventions, in turn, support the government’s response to FNS needs. Another area of strength in Nigeria is the Zero Hunger Initiative, which organizes the efforts of a multiplicity of partners including state governments and international donors in implementing programs to meet the SDG2 targets. Despite these and other steps, the linkage between policy and FNS needs is still weak, and interventions are often underfunded. There remains a strong need for FNS interventions to sharpen the policy process and create an effective coordination mechanism in order to have more meaningful impact. Nigeria’s ERH policy score falls below the regional average and ranks 97 out of 116 countries. While policies related to nutrition policies and agricultural pricing and trade distortions are strong, those for rural investment climate, research skills and extension, rural social assistance, and women’s enabling environment are weak. Furthermore, Nigeria’s overall policy environment scores worse than the regional average in terms of corruption, political stability, and the rule of law, due in large part to insurgency and militancy over the past five years and the massive looting of public funds. Notably, there is also a glaring lack of correspondence between FNS needs and resource flows from domestic and external sources. With regard to resources allocated to addressing FNS needs, domestic public investment in FNS is higher than external flows, including official development assistance and private external investment. However, all the indicators capturing resource flows to FNS are very low, and they all fall below regional average. Increase the number of relevant ministries, departments, and agencies at all levels with a functional nutritional unit by 75 percent in 2017. Identify programs and projects for implementation in the short-, medium- and long-term and design the NPFN to be a 10-year blueprint for eradicating malnutrition to ensure sustainable economic growth and development in the country. This is a departure from previous policies and action plans usually designed for a five-year period. Mainstream nutrition objectives into social protection and safety net programs of all nutrition-related ministries, departments, and agencies by 2020. It is expected that the institutional restructuring and flexibility in programming of activities will be adequately captured in the budgetary process and commensurate resources will be allocated to achieve the new targets identified in the NPFN. To improve FNS in Nigeria, the government should strive to strengthen policy and institutional frameworks for implementing FNS programs and better target some key priority areas. Specifically, the Federal Ministry of Budget and National Planning should establish a platform to accommodate federal, state, and local government collaboration in FNS programs. Likewise, the platform should coordinate development partners, NGOs, CSOs, and relevant committees. Furthermore, the ministry should prepare an investment plan for FNS intervention programs to form the basis for annual budgetary allocations and coordinate with development partners so that financing of FNS intervention programs is not so thinly spread.